This Farm has always been known as "the Switch". In earlier times, the L & N Rail Road ran through the farm. Cars were switched off on the siding to be loaded with timber that was cut here. The most widely known story about "The Swich" was the ghost light. There were numerous reports of a "ghostly light" that seemed to walk the tracks near the old trestle bridge crossing Little Huckleberry Creek. We'll be happy to "show an' tell" more - - - Just Ask! Please have fun while visiting "The Switch"
We also love to eat what we grow. Locally grown food tastes better and is more nutritious. It ripened on the plant, not in a truck. We know where our veggies spent last night. Imported foods do not have the same safety standards as food grown in the U.S.A.
Just look at the diffence a few years of consuming vast quantities of healthy, nutritious Dennison’s Farm fruits and vegetables have made. 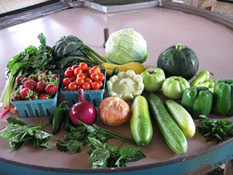 Beans, broccoli, cabbage, cantaloupe, carrots, cauliflower, collards, corn, cucumber, eggplant, fennel, field peas, greens, herbs, kale, leeks, lettuce, melons, okra, onions, peas, hot peppers, sweet peppers, potatoes, pumpkins, radish, spinach, squash, strawberries, sunflowers, Swiss chard, tomatoes, turnips and sometimes flowers.